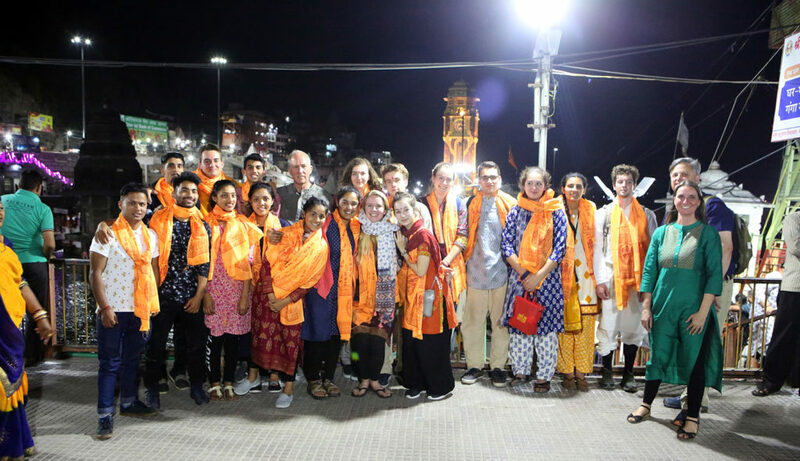 Experiencing Har ki Pauri at the Ganga river was one of the most magical experiences of this trip. 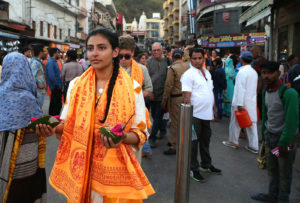 Every evening, people in Haridwar pray at the banks of the river where, according to mythology, the god Vishnu descended from heaven and left his footprint. At Har ki Pauri, the people provide offerings to the goddess Ganga and perform Aarti, or their evening prayer. It was moving to see thousands of people united by devoted prayer. From our seats on the bridge, we could witness the whole function. It began with a procession of priests walking to the river while chanting. During Aarti, everyone joined in the priests’ chanting, and raised their arms in an oath to be better, kinder people. As the sky grew dark, the priests passed around a torch that lit the riverbank. Everyone around us began lighting candles, torches, and flower boats. The muffled sounds of chimes and songs echoed from the loud speaker. I will never forget the view of the fire, light, and their reflections in the Ganga, brought to life by music and prayer. When Aarti was finished, we somehow managed to make our way through the throngs of people to the Ganga. We gathered at the bank to offer our flower boats to the river. I smelled the flame and rose petals as the candle was lit, gently placed it in the cool water, and watched it ride down the soft current of the Ganga .